When Toronto’s Canada Type font foundry made their first appearance in 2004, they could have been just another microfoundry producing nicely made display and script fonts. Over the years, it became clear that they were much more. Although they’re just two people — Rebecca Alaccari and Patrick Griffin — their output has been phenomenal, and of consistently high quality. When they do a revival, they go for the “more is more” approach, investing old letterforms with unseen possibilities. When they design a new typeface, the result can be as luxurious as Memoriam or as modestly practical as Informa. We already interviewed Rebecca in pre- Creative Characters times, so this month it’s the other half of the company that does the talking. 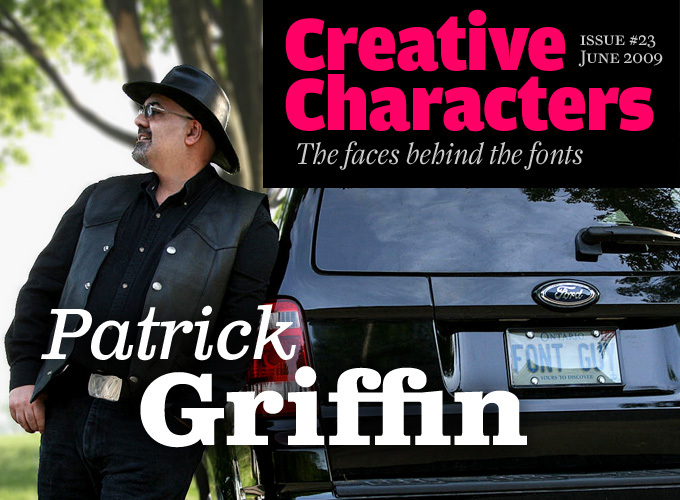 Meet Patrick Griffin, the passionate font guy in the leather hat. Patrick, Canada Type has risen to prominence in only a few years’ time. As type designers, you and Rebecca emerged out of nowhere, so to speak, about five years ago. What is your background, and how did you get into type design? My background is design in general, and set design in particular. Designing props, sets and collaterals for dramatized documentaries and commercials, that sort of thing. I did that for about sixteen years, and there were my first exposures to type. 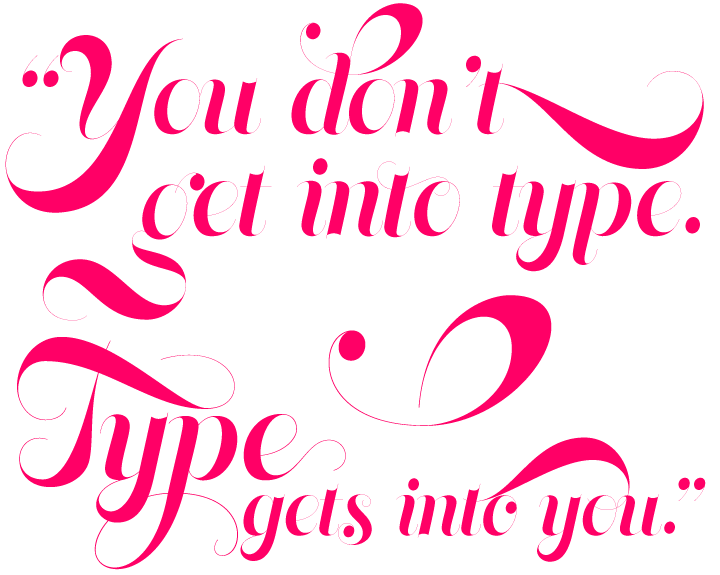 A few months into my rookie year, colleagues began calling me a type freak. Most of them could not relate to the obsession, even those who were doing the exact same things I was. So I think it’s the other way around. You don’t get into type. Type gets into you. Rebecca also has a design background. She was a designer for a couple of big agencies here in Toronto, as well as a freelancer. Her focus was mostly typographic stuff as well. We were both quite happy with our jobs, and did custom font work whenever we could. After Canada Type became popular, the custom font work became a priority. Soon it was full time Canada Type, and the retail operation grew alongside the custom work. What made you decide to start your own foundry, instead of submitting fonts to other companies? For a long time, I was against the idea of publishing our fonts. The type publishing model of the second half of the twentieth century was very similar to the book publishing model. The author of the work would submit it to the publisher, who would take time to consider it, wrap it with legalese, and keep the considerable majority of its revenue in the name of editing, printing, marketing, etc. That was an obviously unfair model. Books enjoy global household appeal while typefaces are specialty products with very limited markets. But it was the only option, so type designers could agree to it and make peanuts from their own work while the non-designers raked it in, or stay out of the game. It really took just the right time, with the right resources and the right distribution model for us to publish our first few fonts. By then, MyFonts had pretty much laid the old publishing model to rest and established a fair, sensible and designer-friendly distribution system. We dipped our toes, and the water was fine. Live long and prosper, Mr. Ying! It’s more of a common sense approach really. Customer convenience is key. We come from design backgrounds, and we’ve been around the block a few times, so we know what a font user wants and, just as importantly, doesn’t want a font to do. So our approach is to try as best as possible to introduce our fonts into people’s workflows as transparently and conveniently as possible. No legal hooks or small print money pits in the EULA. Keep things affordable so that everyone can consider your work. Infinite customer support and give-and-take. Sensible customer request consideration. Focus on type, not pillows. From five years of customer response, it seems that people appreciate what we’re doing and find our stuff useful, I’m happy to say. How did you manage to create such a huge number of fonts in a mere five years? Hard work, constant learning and good planning/scheduling help a lot, but I think it’s mostly the love of it. When you love what you do, you are willing to put long hours into it every day. I can’t speak for every type designer here, but I found that after a while of doing this stuff, type becomes a constant preoccupation of the mind, always running somewhere in the background while I’m doing other stuff, like the tune in your head that doesn’t go away for days. Sometimes it worms itself into daily life in general. Like instead of being angry at a parking ticket, I find myself checking out its design and the fonts used on it. When something has a hold on you like that, it becomes your second skin and comes out of you in spades. It’s one of those things that can be a gift or a curse, depending on the situation. Funny. If I said these same things about a drug, one would be totally justified in considering me a junkie. Each December, the last issue of New York Times Magazine is dedicated to the people who passed away during the year. For the 2008 issue, art director Nancy Harris Rouemy commissioned Patrick Griffin to design a typeface for that project. Based on ideas found in Jezebel and Treasury, Memoriam takes an even more luscious approach, resulting in a delightful, contrast-rich calligraphic display face. Memoriam is recommended for use at large display sizes. In the days of metal type, every foundry had its own Clarendon: indestructible roman with sturdy, slab-like serifs. Cutting-edge designers rediscovered Clarendon in the 1990s as a timeless, unaffected industrial style of type. Yet most of the available digital versions performed disappointingly in text setting. This is what Clarendon Text has come to redeem. It’s a radical but respectful makeover of a classic, with elegant italics inspired by Aldo Novarese’s 1955 Egizio Italic. The new typeface slightly departs from the original Clarendon to make it better suited for immersive reading. Extending the family with small caps and four styles of figures, Patrick Griffin has decidedly written a new page in Clarendon history. Many of your typefaces are based on sources from the past. How do you go about selecting these sources? 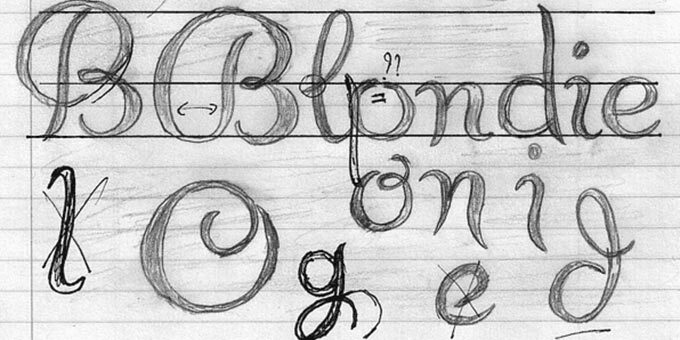 What are the qualities you find most attractive in a piece of lettering or a font from the past? Many of our selections for revival or reinterpretation were faces we consider very meaningful historically. It’s a strange wonder that we were the first people to bring to the digital world, so late in the game, some of Hermann Ihlenburg’s, Aldo Novarese’s and Imre Reiner’s most important faces, or Ronaldson, or some of the ATF faces. The digital revolution, in all its past-effacing glory, seemed to go about with no particular purpose, least of all producing a kind of useful chronological reference that ties type design to typographic history. Digital copies of old typefaces, hacked or uncredited or poorly sourced, were all over the place. And some of the greatest faces and type designers of the past were left in the dust. It was the old frontier story. People saw an emerging market and everyone wanted a slice. The result was a fake sense of cultural originality in the early digital age. Take grunge type and “melted” type, for example. Most people consider them phenomena of the 1990s, with most credit going to Photoshop filters and spoiled/destructivist young designers playing with software. But in reality these two sub-genres were around as far back as wood type, and were very abundant under photo lenses in the 1960s and 1970s. Another example is the swashy and flourished stuff that most people consider indicative of today’s design culture, while it’s actually a mild computer spin on what was happening more than a century ago. So there we were, two decades into computer fonts, and some of the most distinctive and meaningful faces in history were still buried under the carpet of the past. I’m a bit of a design history freak, and inaccurate or made up history gets under my skin. It took me about a month of wading through web search engines and type publisher blurbs before I realized that type history was being reinvented, en masse, which made it incredibly difficult to find what part of the real history was accurately covered in digital form and by whom. One way out of that mess would be for everyone to give better credit to revivals. We can keep complaining about the type industry having been unfair to its designers and workers over the centuries, or how the sprawling masses are uneducated in typography. But unless we use the available opportunity to make our product an educational tool as well as a functional one, we’re bound to repeat the mistakes made a long time ago and we’ll just keep trashing the joint for those who come after us. What are the steps you take to develop a usable digital typeface from a given model? It really depends on the model. With most display faces, if we have a good printed specimen of the original, a scan and digital trace is a good enough start. Then comes the cleaning, measuring, tweaking, fitting, character set expansion, kerning, etc. That’s a straightforward production model. We used it a lot earlier on. But it has certain limitations, some of which can be showstoppers. When confronted with an original that is badly printed, due to cheap paper or ink spread or broken type, it’s better to redraw from scratch, keeping the original elements of the model in mind. With faces intended for use at less than about 24 points, it’s always best to draw from scratch. It takes more time but the final product contains more accurate math and is much more reliable than a font started from a scan. A typeface produced by Canada Type may be a literal revival or a reinterpretation of an old typeface; it may be a new design inspired by a limited number of characters in a piece of lettering. Sometimes the letterforms are completely your own invention. Are any of those methods simpler than others? More satisfying? Literal revivals are the simplest. They’re good for a mental workout now and then but I’m not too crazy about them. While it’s relatively easy to observe an old typeface from two different time perspectives, it’s almost impossible to ignore the technological limitations inherent in it. The majority of those limitations are now gone, so it’s not too hard to synchronize old faces with current technologies. So that’s what I try to do with most revivals. Adding extra features to a font makes it more versatile and expands its functionality, so why not? Takes more time, sure, but any quality product needs to take its time. 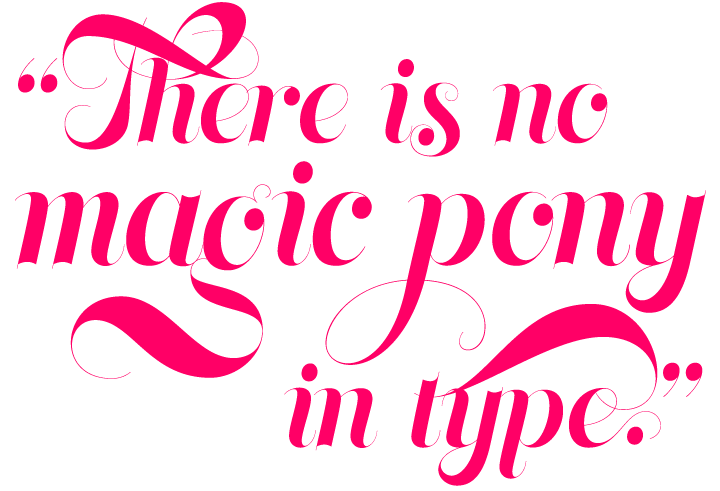 There is no magic pony in type. Original fonts are more satisfying to make, but some revivals are high up there as well. There is nothing that matches the feeling I had when Ronaldson was finally finished. Same with Clarendon Text. Fonts done at the end of long and enlightening research are quite satisfying as well. Taboo, for instance. Ronaldson is the outcome of a discussion that took place three years ago on our WhatTheFont forum. A typeface from a 1970s Italian gardening book was identified as the American classic Ronaldson Old Style, a MacKellar, Smiths & Jordan metal type dating back to 1884. The typeface was the magnum opus of Alexander Kay, a first generation Scottish-American punchcutter with an impressive résumé. Having realized that Ronaldson Old Style had never been digitized, Rebecca Alaccari and Patrick Griffin set out on a great 22-month adventure in type history, the result of which is this digital version of what was a best selling American text face of the 19th and early 20th centuries. Read more about the typeface’s fascinating pedigree here. The Treasury script waited over 130 years to be digitized. Canada Type pulled it off. It took seven months of meticulous work — “the most ambitious, educational and enjoyable type journey we’ve embarked upon,” as Griffin wrote at the time. Based on of the most fascinating lettering styles in American history, Treasury goes beyond being a mere revival of a typeface. Canada Type decided to bring it into the computer age with much more style and functionality than just another lost script becoming digital. The Treasury System takes advantage of one of the most commonly used features of today’s design software: Layering. Check out the Treasury gallery for a quick look at some of the limitless possibilities Treasury has to offer, from simple attractive elegance expressed in the main script, all the way into mysteriously complex calligraphic plates. Sketches for what would eventually become the Chikita typeface. Over the years, you’ve struck up a fruitful working relationship with two designers in particular: American calligrapher Philip Bouwsma, and Dutchman Hans van Maanen who, amazingly, is a science writer. How did these collaborations come about — and how do you work together? We’re really fortunate to be working with both these guys. They come from two entirely different backgrounds and have entirely different sets of skills and interests — they really are on opposite sides of the type spectrum. So working with both of them is one of those rare parallel experiences that make you have a deeper appreciation for human creativity, watching the ways one interest moves and grows differently through different people. Mysterious ways, if you will. Hans is the perfect example of what happens when someone is determinedly passionate about something. As you mentioned, his profession is totally unrelated to type. Yet because of that passion he has for typefaces, he taught himself the ins and outs of font software in a relatively short time, and ended up digitizing some of the best, and most overlooked, historic Dutch and German fonts around. It’s a point of pride at Canada Type that Dutch Mediaeval was the very first text face we ever published. I also love his Serena. Given its beauty and the heart-wrenching story behind it, it’s a wonder nobody had brought it to the digital world before he did. But he’s that kind of guy, a pearl diver. His research is impeccable, and when he finds a lost gem, he’s certainly capable of planning it out and bringing it home in style. Philip is a very special guy, a real giant in his field. I’ve always been a fan of his work, long before he came on board. But after working with him for the past few years, he’s grown so much as a person in my perspective. I’m not sure whether to call him a type designer or a calligrapher — I tend to think of him more like an alphabet philosopher. It’s very natural for him to view any alphabet from multiple angles simultaneously and fluidly, and place it in its exact place historically. Whenever I feel uninspired, all it takes is a phone call to him, and purpose is found again. This past winter I went to visit him at his house in Napa Valley. There was a moment when he was demonstrating a theory to me. He absent-mindedly reached for the shelf, grabbed two pencils and held them between thumb and index like mere mortals normally hold one pencil, and in an instant he had a gorgeous outlined ‘a’ drawn on his notepad, and he just went on explaining to me about calligraphic stroke stress and what have you. The whole thing took one surreal moment. You can’t pay to experience this kind of magic. Ever since your Clarendon Text came out, some of us have been really curious to see when Canada Type would bring out another full-fledged text type family. This month you’re bringing out Informa, your first humanist sans-serif. How did it come about? I hear you had some assistance from Europe. Informa was a project-specific face at first. When we were working on the Canada Type 4th anniversary specimen book in the winter of 2008, we soon realized that we needed a sans-serif text face for intros, captions, descriptions, summaries, footnotes, etc. It was around then that something Erik Spiekermann had said in the Helvetica documentary resonated with me. He said a real typeface’s rhythm and contrast must come from handwriting, and Helvetica doesn’t have any of that. From the ensuing introspective debate emerged the thought that my sans-serif face should be closely based on handwriting. I fiddled around with basing a few sans-serif letters on a modern classic flare-serif, a film type from 1978 called Signa (by Team 77 from Switzerland), adjusting rhythm and contrast, and I was surprised by how well they worked together. So I decided to keep going in that direction. I put together enough of Informa to make the book. It turned out great and we decided to make a decent family out of it. But my workload was huge so I definitely needed some assistance with the production. Enter Elena Albertoni, who has done design and production work for Luc(as) de Groot. She’s great. Very knowledgeable and systematic, with a lot of attention to the most microscopic of details. She saved me months of work. The Informa family would certainly not have been the same without her. Bouwsma Text is one of the high points in the collaboration between American calligrapher Philip Bouwsma and Canada Type. Bouwsma Text is what Roman type would look like if it had been designed by calligraphers instead of metalworkers. It evokes the formal harmony of the Roman capitals, with tapered stems, graduated curves and serifs that are natural entrances and exits for the broad pen. The lowercase reflects history in a seamless web from the uncial and half-uncial to the Carolingian book script and its profusion of styles. The moving calligraphic stroke brings life and instant familiarity to the letters, combining classical legibility and proportion with the warmth and presence of a manuscript. Informa is a new humanist sans-serif that strikes a visual balance between man and machine. Maintaining a careful equilibrium between calligraphic and geometric elements — the two influences that define the genre — it keeps the humanistic traits where they make most visual sense. Informa makes for a comfortable, gentle read that meets the demands of both extended text composition and informative, inviting display typography. One of the family’s most interesting features is its outstanding series of italics: supple and very readable. With Cyrillic and Greek on board, as well as small caps and seven sets of figures, Informa Pro is a great choice for global corporate communication as well as editorial design. Check out the PDF for complete character sets and features. Although all the Canada Type fonts are available at MyFonts, there are quite a few typefaces you made that we haven’t seen here yet, and perhaps never will. These were custom fonts made for specific clients — and some high-profile ones at that. Can you say something about recent custom jobs? I can say a lot about custom work, but I’m afraid I can’t name most of our clients. This is one of those catch-22 situations. We’d love to brag about the fonts we made for the major upcoming athletic event we cannot name, or the ones we did for the international bank we cannot mention, or the work we did for a few major TV broadcasters, or certain global cosmetics and fashion houses — but we just can’t, because of all the non-disclosure agreements and legal stuff we’ve signed. It’s great when there are no NDAs. I can certainly say that we’ve done work for the New York Times, Pixar, Jacquin’s, University of Toronto, and the Montreal Airport, among all those cool non-NDA people. Custom work is really our bread and butter. It’s nice to be popular on the retail side as well, but we’ve been first and foremost a custom design studio since day one. It’s really an entirely different gig. With retail fonts, your customers are all over the typographic proficiency scale — from professional experts to the ones who’ll letterspace connected scripts. With custom work, you mostly get the typographically sophisticated minds, looking for purpose and perfection in their projects. Working with such people is always a fascinating experience, where you can see the ideas come to life while communication is being exchanged. And when the type work is done and is successfully used within the design it was made for, it’s really the ultimate professional gratification on both ends of the working relationship. Canada Type has been working with MyFonts for most of its existence. In what ways has this collaboration influenced your career? Career-wise, MyFonts has been our bridge to everywhere. 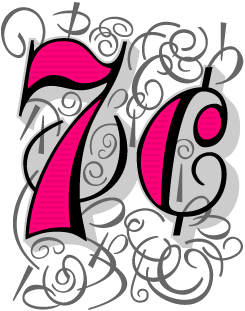 On the custom type side, it gave us a great start, and keeps providing the exposure we need for new business every day. On the retail side, for people like us nobody comes close to comparing with MyFonts. It’s a level distribution field that rewards those who work hard, offering a line-up of useful tools that keeps growing — things like self-marketing templates, live sales reports, true statistical utilities, a fantastic database. Got to wonder how type designers ever retailed their fonts without all that stuff. I really can’t imagine having any enthusiasm for retail without it. Thanks Patrick. I think this is as good a time as any to rediscover some old favorites and hidden gems of your type library. Among Canada Type’s many remarkable revivals are several based on the work of Aldo Novarese, one of Italy’s most prolific and original type designers of the 20th century. Novarese’s Metropol typeface was released in 1967 as a competitor to Stephenson Blake’s Impact. While the latter became a ubiquitous digital font bundled with mainstream software, Metropol never made it past the metal state until Patrick Griffin created Press Gothic, a fresh alternative to big economical poster fonts with clear forms and an urgent yet elegant design appeal. Rebecca Alaccari’s Sympathique is in many ways the ultimate Art Deco font: extremely thin, impossibly tall, impeccably stylized, cheekily simplified: either it makes you laugh out loud, or you find it rather puzzling. In all its breezy extremity, is it useful? Well, if used wisely — and BIG, too — it can provide you with a most elegantly expressive voice for a poster or magazine page. The Creative Characters nameplate is set in Amplitude and Farnham; the intro image features Clarendon Text; the pull-quotes are set in Memoriam; and the large question mark is in Farnham.